A stroke is when a part of the brain suddenly becomes unable to function. This is due to a lack of oxygen, and so all strokes have the common factor of disease affecting the blood supply to the brain. This usually occurs with little or no warning, and causes weakness and paralysis of any part of the body depending on the part of the brain affected. In the United Kingdom, someone has a stroke every 5 minutes. The main cause of a stroke is a blockage to the blood flow, or the bursting of an artery to the brain. When an artery is blocked, this is called a cerebral infarction. When there is bleeding into the brain, it is called a cerebral haemorrhage. There is a third kind of stroke, called an embolic stroke. This is where a blood clot travels through the body and blocks an artery in the brain to form a plug, or embolism. The diseases which cause strokes to occur are similar to those which cause heart disease. Arteries in the brain may block due to them being furred up by fatty material in the same way that heart arteries become blocked and cause heart attacks. Blood clots can arise from heart diseases where the heart has an irregular rhythm, or where there is damage to the valves of the heart. When a cerebral haemorrhage occurs, the commonest cause is due to a weakness in the wall of an artery - called an aneurysm. These are sometimes present in people from birth as an inherited weakness, but more commonly are the result of high blood pressure. What Are The Signs And Symptoms Of Stroke? 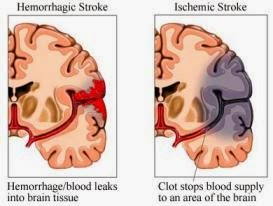 Any symptoms that occur after a stroke are immediate, and depend both on the area of the brain involved and the degree of damage caused. The commonest symptom is weakness or paralysis of one side of the body. There may be loss of sensation and movement of part of an arm or leg, or complete loss of any function along one side of the body. Speech is often affected, along with facial weakness and tingling or numbness of the face. If the stroke affects the base of the brain, there may be problems with swallowing, breathing and consciousness. Some patients have a warning attack some time before a major stroke. This is often in the form of a short-lived weakness or numbness down one side, or a temporary problem with speaking. These are called TIAs - transient ischaemic attacks - and are usually completely better within 24 hours. Will I Have Any Tests Or Investigations For Stroke? The main test of use if a stroke is suspected is called a CT scan. This will not only rule out any other possible causes for a patients symptoms, but is also able to confirm whether a stroke is due to a clot or bleeding. If it is due to a clot, the heart will be tested for any source of these such as valve problems. It may also be necessary to perform a soundwave test called a carotid ultrasound, which looks at the arteries in the neck to see if there is any kind of blockage to the blood flow there. A neurologist - a doctor specialising in brain disorders - may assist in the diagnosis and management of stroke patients. The main care of patients who have had a stroke however remains good nursing care. Initially, if the blood pressure is found to be high, this will be lowered by medication. If a clot is the cause, aspirin is started and if it is found there are problems with the heart valves, warfarin - a blood thinning drug - will be used. Any rise in the blood sugar level, which often occurs after a stroke, will be closely controlled, and oxygen may be needed in the early stages to try to minimise the brain damage. What Course Will The Illness Follow? This entirely depends on the severity of the stroke and how much damage it has caused. In the early stages there may be problems with swallowing, which in turn can lead to breathing difficulties or chest infections. Once a patient's condition has settled however, attention is turned to maximising the function that remains. This involves intensive treatment by physiotherapists to improve mobility, occupational therapists (who use a wide variety of activities to help regain dexterity), and speech therapy. The aim is always for the patient to resume as many of their pre-stroke activities as possible, but a total return to their previous condition is the exception rather than the rule. Physical therapy may continue following discharge home, but some stroke patients cannot be cared for adequately at home and so need residential or nursing home care long-term. Can I Do Anything To Help Myself? The main factor is to identify and treat high blood pressure - this alone reduces the risk of stroke considerably. Just as important is stopping smoking since the furring up of arteries in the brain and neck is greatly speeded up by smoking. If there is any diabetes, a good control of the body's sugar level is very important as is controlling the level of cholesterol in the blood, either by diet or tablets. Should the heart be beating irregularly, tablets such as digoxin should control this. This is often used in combination with aspirin or warfarin as blood thinning medicines to reduce the risk of any further strokes. 1. Did your symptoms occur suddenly? 3. Does anyone else in your family have similar problems? 4. Have you been treated for high blood pressure in the past? 5. Have you ever had what have seemed like stroke symptoms, but which have disappeared after 24 hours? 1. Am I at risk of a further stroke? 2. How often will I need my blood pressure checked? 3.What help can I get at home to help me with mobility and my daily activities? 4. If I am able to do them, will activity or exercise hurt me? 5. Will I need to stay on Aspirin or other tablets for life? Further information and help from The Stroke Association. By Dr Roger Henderson, MB BS Lond., LMSSA Lond.